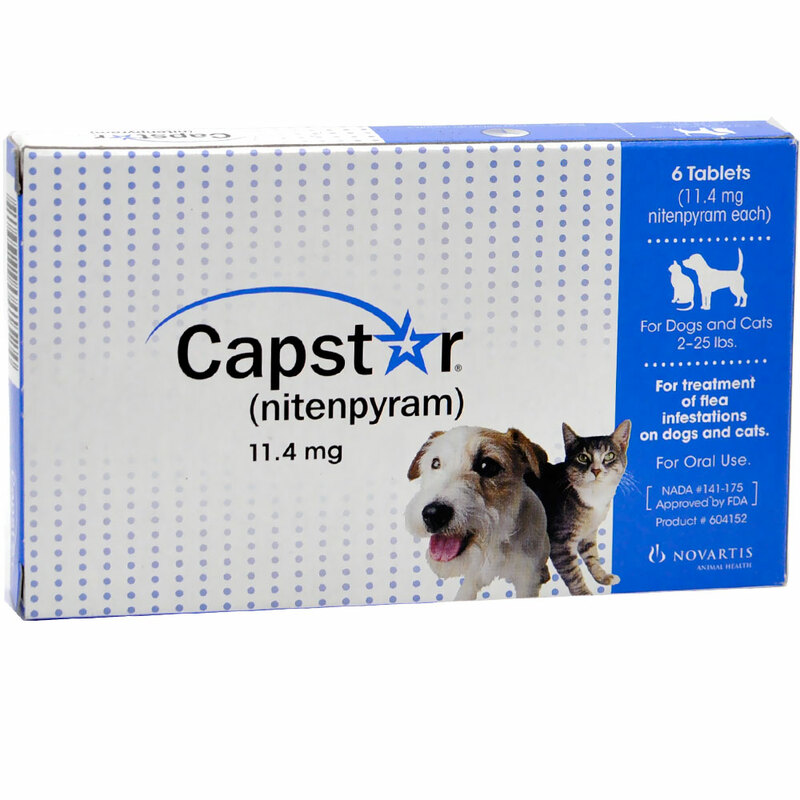 CAPSTAR Blue a single fast acting dose of Capstar (nitenpyram) should kill the adult fleas on your pet. If your pet gets re-infested with fleas, you can safely give another dose as often as once per day. 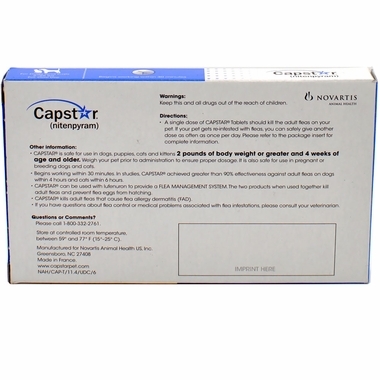 To administer CAPSTAR tablets, place the pill directly in your pet's mouth, or hide it in food. If you choose to hide the tablet in food, watch closely to make sure your pet swallows the pill. If you are not sure that your pet swallowed the pill, it is safe to administer a second pill. We recommend you follow up CAPSTAR treatment with a monthly flea control product such as PROGRAM, Frontline or Advantage. Then keep CAPSTAR on hand for the times when there is a visible flea re-infestation. 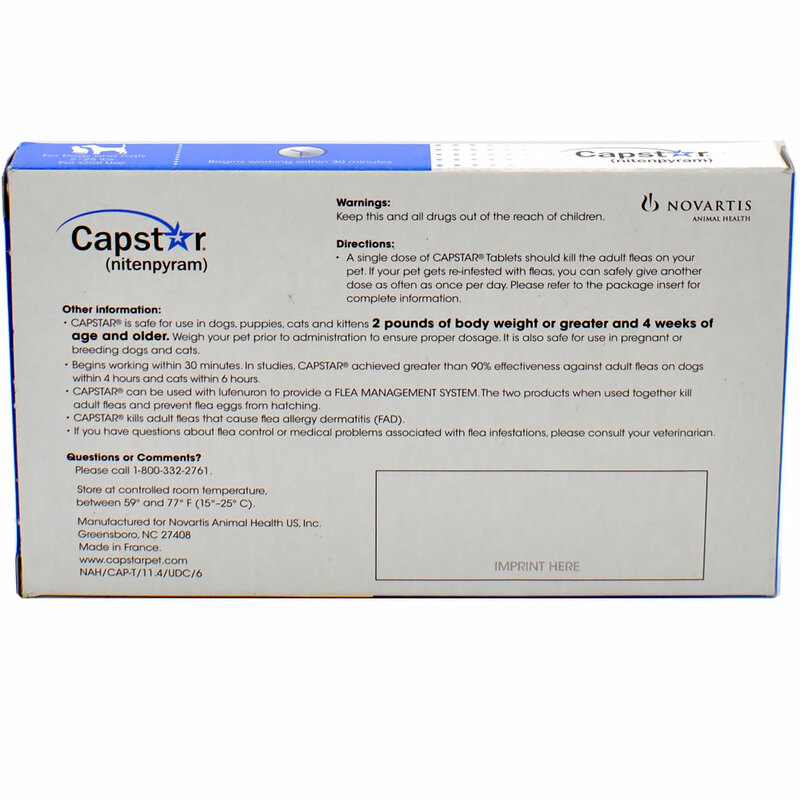 Capstar is approved for use in dogs and cats over 4 weeks of age and over 2 pounds of body weight. It is available in packages for dogs and cats 2-25 pounds and dogs 25.1-125 pounds. Choose the correct strength and give 1 tablet as the dose. For pets over 125 pounds give the correct combination of tablets. Side effects: Side effects that may occur in dogs include Lethargy/depression, vomiting, itching, decreased appetite, diarrhea, hyperactivity, incoordination, trembling, seizures, panting, allergic reactions including hives, vocalization, salivation, fever, and nervousness. Side effects that may occur in cats include Hyperactivity, panting, lethargy, itching, vocalization, vomiting, fever, decreased appetite, nervousness, diarrhea, difficulty breathing, salivation, incoordination, seizures, pupil dilation, increased heart rate, and trembling. There are no known drug or food interactions . Cautions: Pets may scratch as a result of the fleas dying, but it is a temporary condition and not a reaction to the medication itself. Store this product at room temperature. Keep out of the reach of children and pets.